Beth mentioned recently seeing my daughter's Toy Story Party. She was excited to share this party with me because she was so happy to see that she wasn't the only mom who bought boy pjs for her daughter. That made me smile! Whatever mades the kiddo happy... right? The cake is precious and I LOVE the wooden container used to hold these s'more pops! I love all the SUPER CUTE DETAILS here! Check out Beth's Blog for all the fun details! Yee Haw is right...great party! That is so cute - I'll have to store this idea away! Really cute! 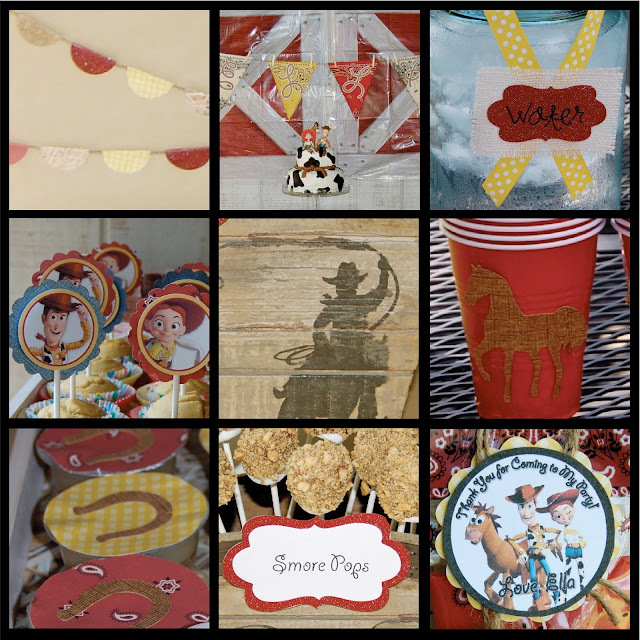 I just helped with my nieces party this last weekend and this was the theme but we focused more on the cowgirl and added a little carnival twist. This is sooooo cute! So much detail yet sweet and simple. that cake is so cute!! great party. I love this party! Everything looks perfect! I'd like to invite you to visit my husband's new photography blog (finally convinced him to create one). This is the link if you want to stop by, you're more than welcome.